So as we potentially say farewell to Summer (but let’s face it we can’t be certain), the stores are starting to fill their shelves with their Autumn/ Winter collections, goodies for cosy nights in and soon enough it’ll be starting to look alot like Christmas. Breaking with tradition today I’m taking a look at this months ‘My Heart Desires’ a few days early, mainly because I didn’t have the photos for the post I had planned and the weather yesterday was very Autumnal and dull. Anyway I digress, as always. Jo Malone Pomegranate Noir Cologne, from £43 If we are honest, I’m pretty sure we would admit that this is where the Jo Malone journey of discovery started from. The Pomegrante Noir scent is one of the most reknowned in the world (must be said in the tone of Jeremy Clarkson for full effect and dramatisation) and is instantly recogniseable. I adore this scent and I think my bathroom cabinet needs it in it’s little square life! 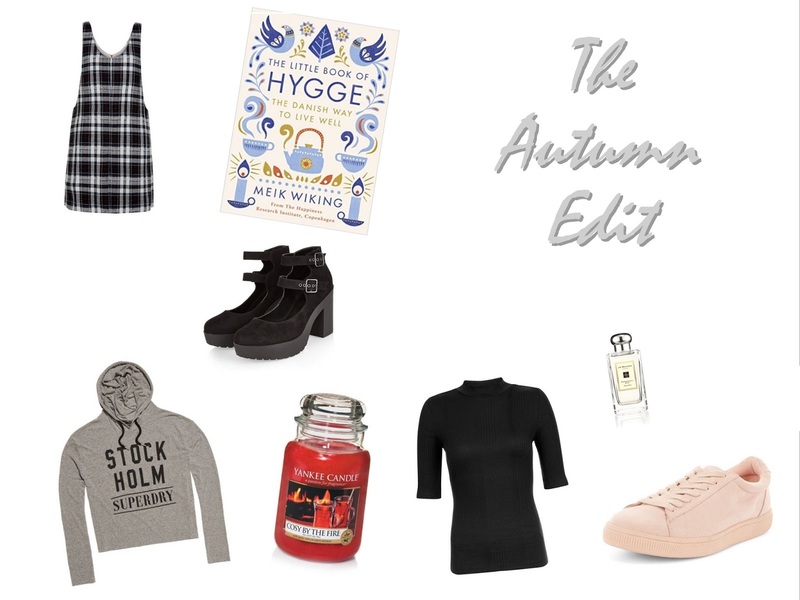 The Little Book of Hygge, £6 Amazon | As the cold, harsh, Winter days draw in and we have less and less opportunity to go off adventuring, I want to refocus my attention on things that make me happy. I’ve heard a lot about Hygge lately and I’m intrigued to learn more and so as soon as I finish the three books on my bedside table I want to add this to my bookshelf. Large Yankee Candle Jar, £21.99 | No specific scent, but instead of something light and fluffy like the adorable Lovely Kiku I’m really looking forward to lighting something with a bit more wood and spice to it. White Check Pinafore Dress, £24.99 New Look | New Look have really upped their fashion game recently in my eyes. For years I’ve ventured into my local store and left empty handed, yet lately I just can’t resist their latest threads. This pinafore is definitely catching my eye. Ribbed Funnel Neck Top, £8.99 New Look | Well this one is because I think this would look awesome layered under the above dress and we all know that the best thing about cooler weather is layering! Chunky Block Heels, £27.99 New Look We all know by now that I’m embracing different styles and trends at the minute as I look to update my wardrobe a little as my self confidence grows a little. I have learned to love heels lately and I really want to keep trying out new styles and these look comfortable and stunning. Pink Suedette Trainers, £19.99 New Look I’ve seen these lovelies shared online a few times lately and whilst I love the original Adidas Superstar trainers, let’s face it, we can’t all be adding them to our wardrobes with their price tag. These not only look amazing but the price is rather attractive too. Nordic Graphic Cropped Hoodie, £34.99 Superdry Yes the Superdry addiction is still real and yes there are still things that they sell and I don’t own like this new season hoodie for instance. I don’t care what anyone says, a hoodie is still one of the best ways to wrap up and feel snug!